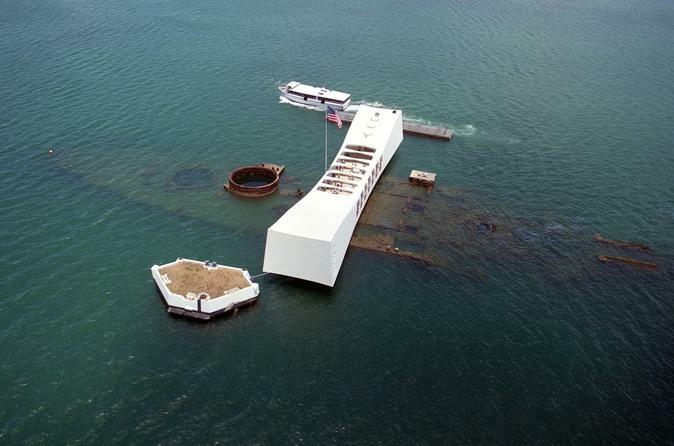 The Arizona Memorial is the final resting place of 1,177 Sailors and Marines killed during the attack at Pearl Harbor. The surprise attack by Japanese forces on December 7, 1941 secured the United States involvement in World War II. The memorial is a stark reminder of the sacrifices made by the men and women of our armed forces to protect our freedom and our way of life. Once we arrive at the visitors center, our guides will orientate you with the surroundings and give you a detail analysis of the events that happened on 7 December as well as the events that lead up to the attack on Pearl Harbor. Our guide will help you answer the ultimate question, "Why did Japan attack Pearl Harbor?" Our tour will continue with a short 23 minute video (mandatory). The video places an extra emphasis on the significance of the attack, the Arizona Memorial, and Pearl Harbor. Upon completion of the movie, we will depart the visitors center via Navy Launch (boat) to the Arizona Memorial and Battle Ship Row. While the USS Arizona is under repair, we will not offload at the Memorial, instead the Navy Launch will conduct a harbor cruise. On the harbor cruise, you will have an opportunity to see the sunken memorial and Battle Ship Row. From this vantage point you will be able to see the USS Missouri and the mooring quays marking the location of Battleship row and the active military fleet. Our guides will not be with clients during this portion of the tour. Due to current reconstruction of the Arizona memorial we are offering 1 free hour of Guide Service starting 1 July 2018. Upon return to the visitors center, you will have the opportunity to visit the gift shop and the USS Bowfin Submarine before returning to the hotel. If you are not interested in visiting the Submarine, then ask your guide what you will have time to visit- Iolani Palace, Kamehameha Statue, Pali lookout, and etc. Additional hours will be charge accordingly. The free hour is only given to tours of the Arizona Memorial. The admission fee for the USS Bowfin is the responsibility of the client. Tickets can be purchase through Keawe Adventures or on the day of the tour. Please keep in mind that bags are not allowed within the park.